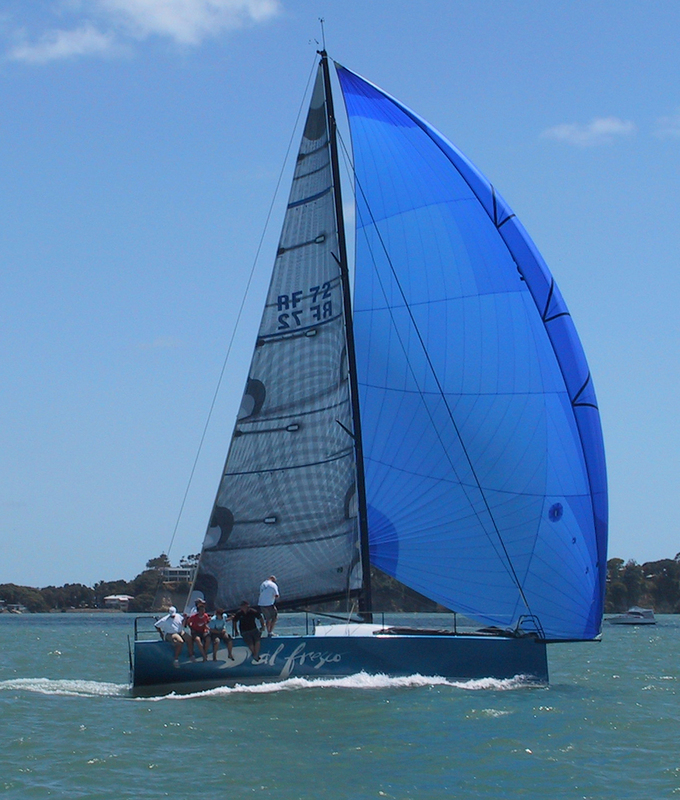 Following her giant killing performance in the Fremantle to Geraldton Yacht Race and more recently IRC dominance in the Coventry Reef race, the Bakewell-White designed 11m Alfresco has set the bar talk alight in Western Australia where the hot little twilight racer has been dubbed the “Little Blue Maxi”. Built and launched in New Zealand earlier this year, Alfresco resides in Perth and is the third Bakewell-White designed yacht owned by Frank Saraceni. Built in carbon by Davie Norris Boatbuilders in Christchurch, and rigged by NZ Rigging this is a very New Zealand project put together by Rodney Keenan of Evolution Sails and then exported to Western Australia. The design philosophy was very much one of, let’s build a fast offshore capable 36ft yacht and then we will get an IRC rating and see how we go. Fast and fun was the priority for the corporate twilight sailing that the boat is largely used for on the Swan River, with space and safety in the cockpit a priority to look after the many novice passengers that make up the crew for these races. The twin wheel steering is a result of this requirement allowing the helmsman a clear view of passengers and crew and also taking up less cockpit space than a tiller. Alfresco’s recent line honours win in the 280nm Fremantle to Geraldton was an eye-opener for many when the smallest boat in division one showed the way home to the 50ft fleet. Hitting speeds in excess of 28kts Alfresco was ahead of the Volvo60 race record at the three-quarter race distance, but unfortunately the breeze dropped out for the final 50 miles letting the record slip away and many of the tail enders to make gains. A second place on IRC for the race topped off the weekend and underlined the performance. The follow up Coventry Reef race once again saw Alfresco leading the charge downwind, rounding the reef mark with the 50 ft boats and hanging on upwind for the leg home and a resounding win on IRC, perhaps putting a lie to the common belief that a sub 50ft yacht needs to be heavy rather than fun to compete under IRC. Following these early results a sister boat is now under construction at Davie Norris’ yard for another West Australian owner, whilst two more orders for the US are under negotiation.